As a second-generation community organizer from Pueblo, I am following in the footsteps of my parents who have dedicated their lives to achieving health equity in Colorado. My parents contributed to the development and sustainability of the Pueblo Community Health Center—an effort that gave 40,000 Puebloans access to health care. My dad was also the CEO of La Clinica del Valle, a chain of non-profit medical clinics that provides health care to low-income people and migrant workers in Eastern Colorado. So you could say that fighting to ensure our health care system works for everyone is in my blood. 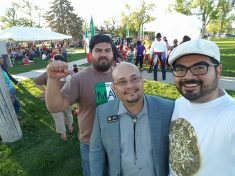 Pueblo has a rich culture of community, union, and political organizing that began in the 1970s. Community leaders have been addressing issues around access to health care, job and financial security, equitable opportunities for academic success, and eliminating environmental dump sites in or near low-income neighborhoods of color—to name a few—for decades. There are two main issues that I have seen first-hand in the Pueblo community. The first is access to food. In Pueblo, we have three large, low-income neighborhoods that are considered food deserts, which means the community has little-to-no access to fresh food. This leads to poor health, as the only places to buy groceries are from convenience and dollar stores. There are a number of ongoing local efforts to combat this issue, including an innovative program led by our local non-profit hospital, St. Mary Corwin. The Food Prescription program allows for local growers/farmers markets to bring fresh food into one of the neighborhoods most in need. This is a great example of how the health care system can play an active role in addressing the social determinants of health. In order to achieve improved health outcomes, health care entities must address these root causes of ill health, including making it easier for our neighborhoods to access healthy food. The second major issue we must address in Pueblo is income. Pueblo has been facing difficult financial times since the layoff of over 5,000 people from the giant Colorado Fuel and Iron steel plant in the late 1980s and the housing crash in 2008—and with rising mortgage rates across Colorado, this problem isn’t getting easier to fix. More than 40 percent of households in Pueblo earn less than $35,000 a year. For these reasons, we were proud to support the increase in Colorado’s minimum wage. Investing in our community is crucial for breaking down the barriers our community faces and improving the health of all who live here. At Center for Health Progress, we value our communities, and recognize their contributions to the history and culture of Colorado. That’s why we’re investing in our neighbors and empowering Coloradans to advocate for themselves. It’s why I continue to strive relentlessly toward health equity—as a product of my parents’ civil rights and social justice work, I know no other way.